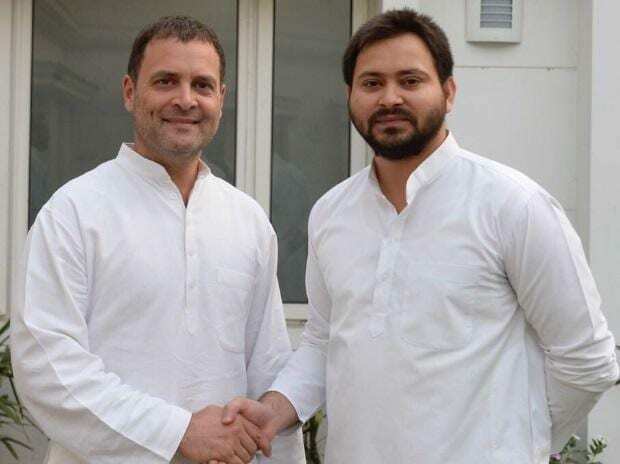 The Congress is "best equipped" to lead the opposition's charge against the BJP in the upcoming Lok Sabha polls, RJD leader Tejashwi Yadav said Sunday, asserting that the grand old party will have to handle its leadership role with "large-heartedness" and accommodate regional parties. Yadav also hailed the Samajwadi Party-Bahujan Samaj Party alliance in Uttar Pradesh and emphasised that his "courtesy call" meetings with Akhilesh Yadav and Mayawati post the tie-up should not be construed as a "pressure tactic" aimed at the Congress. In an exclusive interview to PTI, the Rashtriya Janata Dal leader said since Congress is India's oldest and and currently the second-biggest political party having a pan-India presence, it is in a very strong position to win maximum number of seats among the opposition parties. In 2014 Lok Sabha polls, among the prospective opposition grand alliance parties, the Congress had won 44 seats, the Mamata Banerjee-led Trinamool Congress won 34, the Samajwadi Party won five, while the RJD had bagged four seats. "I don't find anything wrong if the Congress plays a pivotal role in forming the alliance or taking the leadership role of the alliance into the elections. But having said that, they have to accept that each state has different ground realities," Yadav said. The Congress, being the party with national acceptance and maximum footprint in the opposition, is "undoubtedly best equipped" to lead the opposition's charge against the Bharatiya Janata Party or the National Democratic Alliance, the former Bihar deputy chief minister asserted. "However, the Congress will have to handle their leadership role with large-heartedness and play a proactive role by accommodating regional parties with their agenda. "In states where Congress don't have a robust base, it must allow regional outfits to occupy the frontal-attack position against the BJP," Yadav said, emphasising that regional parties have a greater ability to transfer votes. The concentration is on winnability, hence the coalition must be decided state-wise and seat wise, said the 29-year-old son of former Bihar chief minister Lalu Prasad. Every party will have to compromise or lend space to other parties depending on the situation in a particular state for forming a winning alliance, Yadav said while replying to a question on whether the Congress has to be more giving to regional parties to strengthen the opposition coalition. Asked if leaving out the Congress from the SP-BSP tie-up will impact the opposition's national level coalition, he said the people of India feel they have been "duped badly" and have made up their mind to get rid of propagandists for their own well-being. On whether the SP and BSP will be a part of the mahagathbandhan' in Bihar, the RJD leader said principally all opposition parties are together against the BJP-led alliance. "You don't always need seats to contest to prove that you are part of an alliance. Sometimes lending unconditional support works wonders for sending the message across to the electorate. "It is true that the SP and the BSP aren't main political parties of Bihar, but we have high regard for them and their politics. We have seen that SP-BSP alliance has decided not to field their candidates in Amethi and Raebareli," Yadav said. Once arch-rivals, the SP and the BSP announced this month their tie-up in UP for the 2019 Lok Sabha polls, sharing 38 seats each and keeping the Congress out of the alliance. Tejashwi Yadav's remarks come amid hectic efforts by the opposition to forge a strong alliance to take on the BJP in the general election. Leaders from several opposition parties, including Yadav, came together Saturday, vowing at a mega rally in Kolkata to put up a united fight in the coming polls and oust Prime Minister Narendra Modi from power. Prime Minister Modi had earlier hit out at the Mahagatbandhan for the polls, saying it was an "unholy alliance" of various political parties for "personal survival". The BJP has also slammed the SP-BSP tie-up in UP. Yadav also hit out at those dubbing his meeting with SP chief Akhilesh Yadav and BSP supremo Mayawati in Lucknow as a pressure tactic aimed at the Congress, saying his family always had close ties with the two leaders and the meetings were courtesy calls. Akhilesh ji is part of our extended family and 'behen' Mayawati ji always had cordial relations with us. When she resigned from Rajya Sabha, my father publicly said RJD would always be ready to send her to Rajya Sabha if she agrees, Tejashwi Yadav said. Even last year during RS elections in Bihar, I called her to request her again to enter Rajya Sabha with RJD backing. So my courtesy calls to them shouldn't be construed as a pressure tactic, he said. As far as Bihar is concerned, irrespective of the number of MLAs in the assembly or being part of the government or opposition, everyone knows RJD is the biggest party, he said. It is RJD's fear that has kept the BJP and Janata Dal (United) together, he claimed. Everyone knows RJD brings major portion of the electorate support to the table in Bihar and no one denies that, he asserted. On BJP terming the SP-BSP tie-up an opportunistic alliance, Yadav hit out at the saffron party saying when it has tie-ups, it calls it "smart politicking", and asked what should its coalition of about 40 parties be called.